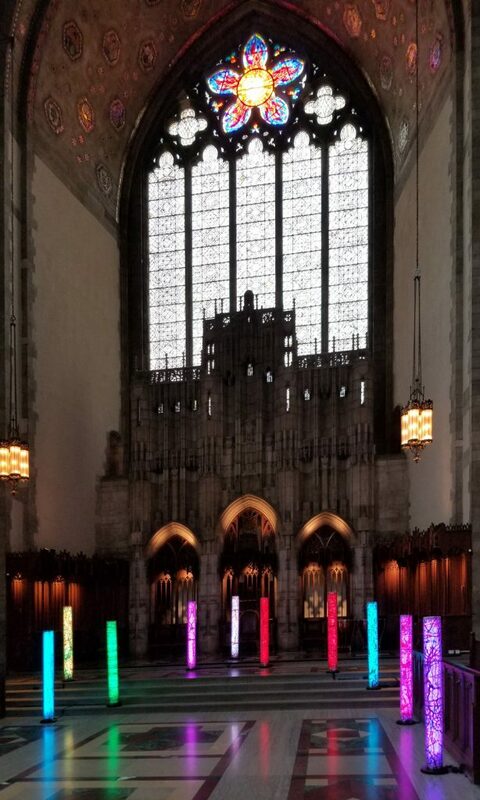 Columns of Thought were installed at Rockefeller Memorial Chapel from April through May, 2018. These columns are free-stanidng, independent structures, paralleling our own human existence. The images consist neuronal profiles intertwined with my own MRI brain scans, EEG’s, and transformations of my own art work. It is from these extensive, overlapping neuronal networks that our consciousness, being, and independence emerge. Each piece consists of 3 layers of polycarbonate, back-light by LED color-changing lights. The 3 layers of images correspond to our own 3 layers of awareness: consciousness, sub-consciousness and unconsciousness. Each piece emits ever changing colors of light, just as we emit varying rays of connection to others. As the colors change, the images change dramatically. 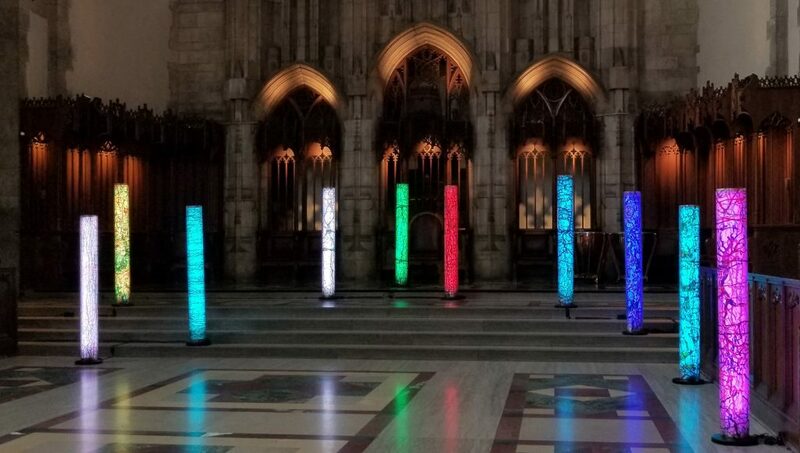 In this installation of 10 columns, all of similar structure, but of different appearance, correspond to 10 individuals in an interacting societal whole. On many levels these works address the origins of identity, and what it is that allows us to experience and learn from the world around us. Hopes and dreams are essential for our human existence. These works explore the dreams and aspirations of all of us, and include pieces about artists and writers, incorporating their art work, writings and portraits. The exhibit itself was spectacular. To get a sense of it, please view a YouTube video by clicking here.